Frank Menendez, 54, of Long Island, New York, joined the NRA at the Great American Outdoor Show in Harrisburg. Less than two weeks after two shooters killed 12 other students and one teacher at a Colorado high school, the National Rifle Association went ahead with an annual meeting in nearby Denver. The event was scaled back that year, but some in the community didn’t want the NRA there at all. For Menendez, it looked like an NRA rally. He refused to join the NRA for years. But this week, the 54-year-old welder drove from Long Island, New York, to Harrisburg for the Great American Outdoor Show in Harrisburg. There, he paid the $35 membership fee and joined the NRA. 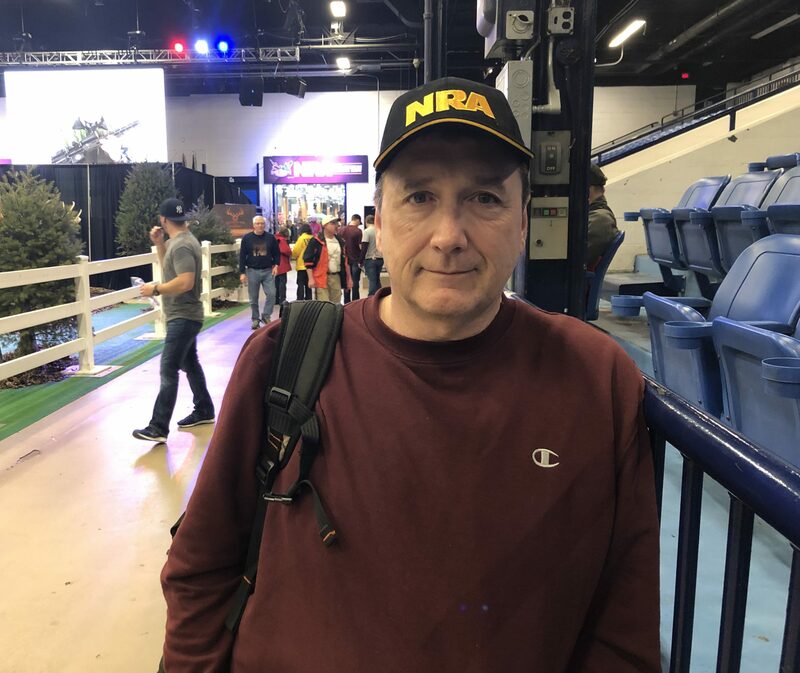 He took one of the free, black-and-yellow NRA hats and wore it throughout the Pennsylvania Farm Show Complex and Expo Center. So what changed? Menendez doesn’t really think the NRA has. Instead, he thinks the rest of the country has. It’s to the point where, in his view, regular gun owners like him are seen as bad people. Booths at the Great American Outdoor Show in Harrisburg are seen on Feb. 7, 2019. The NRA offers free admission to the show for people who join or renew their membership. This year’s Great American Outdoor Show — which the NRA has organized in Harrisburg since 2014 — falls during a challenging time for the group. The NRA’s tax records for 2017 showed a decline in revenue, including for membership dues, The Daily Beast reported a few months ago. And in the 2018 election, groups that push for increased gun restrictions outspent the NRA, The New York Times and others have reported. On Wednesday, the U.S. House Judiciary Committee held what Democrats said was the first hearing on gun violence in nearly eight years. In Menendez’s home state of New York, Democratic Gov. Andrew Cuomo has successfully pushed for a number of new gun restrictions. Menendez thinks the measures have gone too far. In 2013, following the Sandy Hook Elementary School mass shooting, New York lawmakers passed the NY SAFE Act, which expanded an assault-style weapons ban, created a new ban on magazines that hold more than seven rounds of ammunition, and expanded background check requirements. In December, Cuomo, outlined multiple gun measures he wanted to pass in the the first 100 days of his third term. Last month, the New York State Legislature passed several gun bills, including one under which people could temporarily lose gun rights through extreme risk protection orders. Others ban bump stocks, prevent school district teachers from being armed, and establish an extension for background checks. While Menendez felt like he had to join the NRA even though he thinks group can have a “relentless” approach, several other NRA members interviewed at the Great American Outdoor Show had less complicated feelings about the NRA. But Youells doesn’t think the NRA has the same power it once did. Youells has a 27-year-old daughter. Her friends, he said, don’t seem interested in guns. 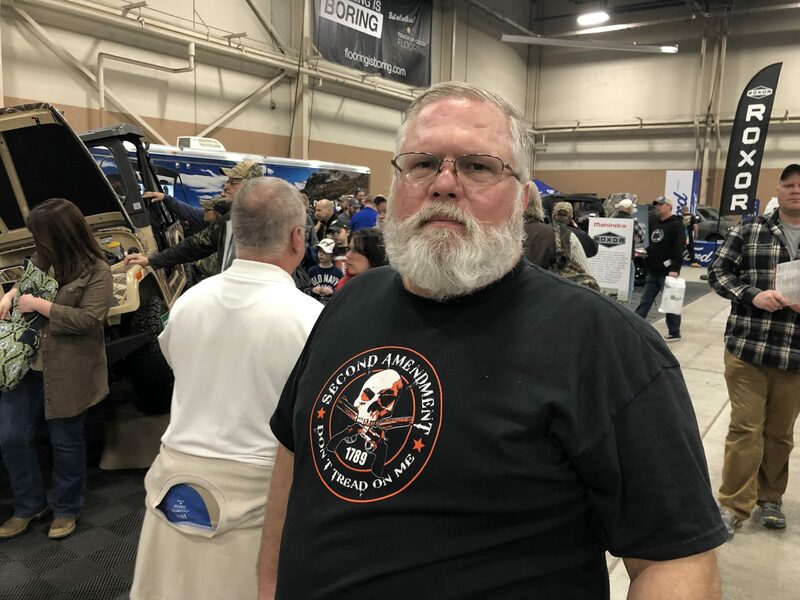 John Youells, 55, of Montgomery County, is seen at the Great American Outdoor Show in Harrisburg on Feb. 7, 2019. Still, the NRA has plenty of power. It says it has record high membership of 5.5 million. In Pennsylvania, a significant gun bill passed last year that increased gun restrictions for people convicted of a misdemeanor crime of domestic violence and for certain defendants in protection-from-abuse cases. While a prominent statewide gun-rights group opposed the bill, the NRA was neutral. 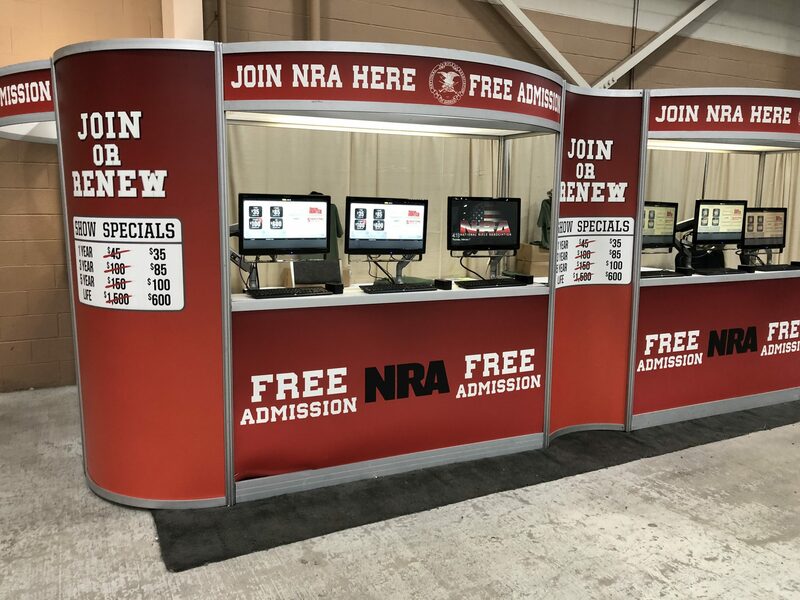 At the Great American Outdoor Show, one NRA station had red carpeting, a glass case display for the NRA National Firearms Museum, a hunter education table and a spot to join. D. Fischer — whose first name is short for Dennis — stopped by with his wife, Andrea Brown, and kids, and picked up some of the handouts. Fischer joined the NRA when President Barack Obama was in office and pushing for a new ban on assault-style weapons and a ban on high-capacity magazines. “Gun freedoms were under attack,” Fischer said. 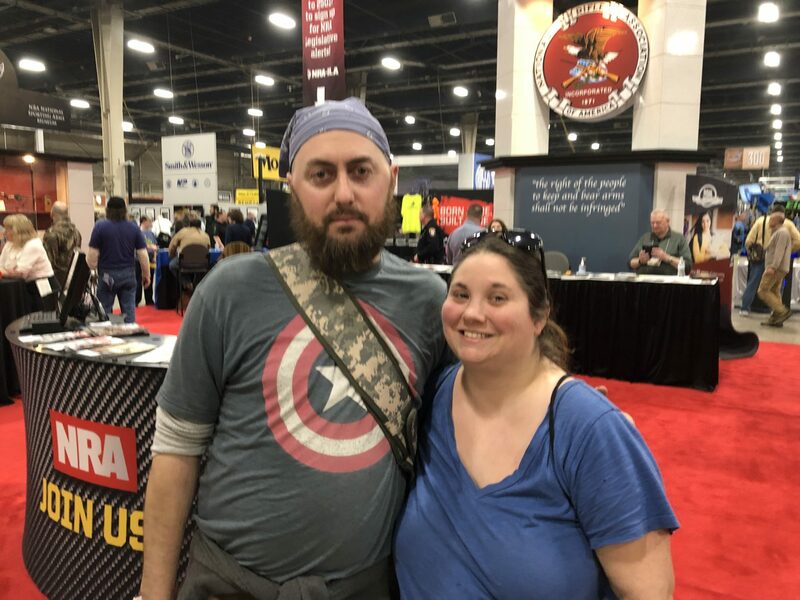 D. Fischer and his wife, Andrea Brown, are seen at an NRA station at the Great American Outdoor Show on Feb. 7, 2019. Fischer, a Lancaster County laborer for a dairy business, said he’s not as worried about losing gun rights now as he was back then. It seems to him that ammunition prices and some guns are cheaper and easier to find, because there’s not a rush of people trying to hoard them. He said other issues, such as border security, seem to be getting more attention in the news. “There’s always concern, but I feel that it’s a little bit more laid back right now,” Fischer said. Ed Mahon can be reached at 717-421-2518 or at emahon@papost.org.